Tip: Before getting started, check out the clearance between the oil pan and the crossmember to see if there’s enough room to remove the pan. Performance gains: A new timing chain and sprockets will deliver consistent performance and reliability. Although timing chain removal and replacement in itself is a simple task, the multitude of steps one must take in order to access this area of the motor can be quite involved, but the cost savings are significant (vs. having a professional shop to the job). If the motor is already out of the car and perched nicely on an engine stand, most of the dirty work is done. However, if it’s necessary to perform the deed with the motor still in its cradle, the job may be slightly more challenging. But don’t be discouraged. This is how we all learn, right? We first need to access the timing cover. That means all accessories blocking the path to the cover and chain must go. Remove all braces, brackets, and hoses that may interfere as well. The more room you allow yourself, the better! Be sure to fully drain the cooling system prior to removing the water pump, thermostat housing, or any cooling lines. You may find it beneficial to pull the radiator for extra clearance too. After removing the timing cover bolts, gently pry the sides of the cover to release it from the block. With the front of the motor disassembled, we move down below to the oil pan. The timing cover is designed in such a way that it requires the removal of the oil pan to replace. Raise and securely support the car with a pair of jackstands. Drain the engine of its oil and remove the pan. Depending on the type of oil pan used and the clearance between the crossmember, you may not be able to remove the pan entirely without loosening the motor mounts and slightly hoisting the engine. If this is the case, you should consider pulling the motor out completely. True, it’s a little more work than you may have expected, but it sure makes the project a lot easier and cleaner once the motor is out. Besides, there’s always plenty of other stuff you can readily accomplish when the engine is sitting on a stand. Either way, the pan needs to come off. Loosen and remove the oil pan for complete access to the timing cover. 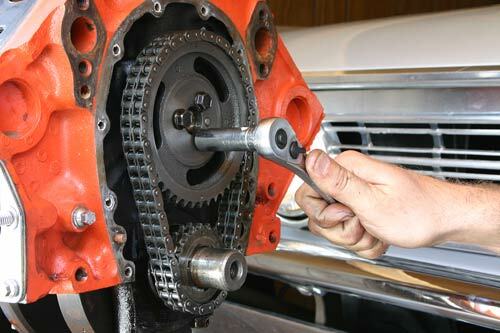 Using the proper removal tool, loosen and remove the pulley and the harmonic balancer from the front of the crankshaft. You should now have full access to the timing cover. The cover is secured to the engine block by a series of small, ¼” bolts. Remove the bolts and the timing pointer (if separate). The cover will most likely be stuck to the block by old gasket material and sludge. Gently pry the sides of the cover with a screwdriver or similar instrument. 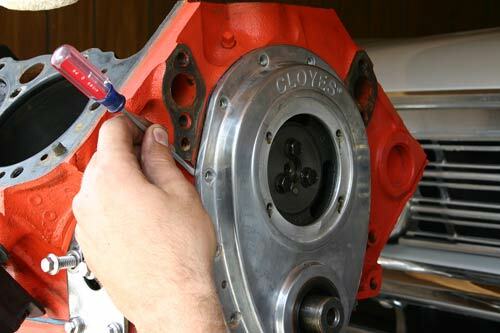 Using a crankshaft socket and a breaker bar, spin the motor in proper rotation to align the timing marks on the two sprockets. The two marks should be facing each other prior to removing the sprockets or chain. With the cover removed, examine the location of the upper and lower sprockets in relation to each other. 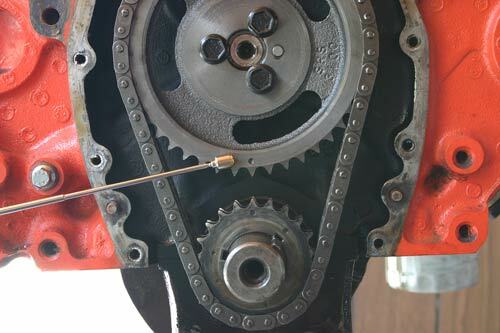 Using a crankshaft socket, turn the motor over in the direction of rotation until the marks on both sprockets are facing one another (see photo 4). When the sprockets are in this position, the No. 6 cylinder is at TDC. To achieve TDC of the No. 1 cylinder, simply turn the crankshaft one full revolution. The camshaft timing mark will now be at the top of the sprocket. In reference to the marks, there will be a small circle machined on the surface of each sprocket. Remove the mounting bolts of the sprocket to loosen and disengage the chain. Remove the bolts attaching the upper sprocket to the camshaft. This will allow you to slide the sprocket away from the cam and release the tension on the chain. They can now both be removed from the engine. While the timing cover and chain assembly is dismantled, you should consider replacing any additional components that may be problematic or on their way to failure. Common replacements may include a timing cover oil seal or even a new timing cover assembly. The front oil seal is well known for its leaky tendencies, and can be damaged, torn, or become corroded quite easily. The seals are cheap and take no time at all to replace. 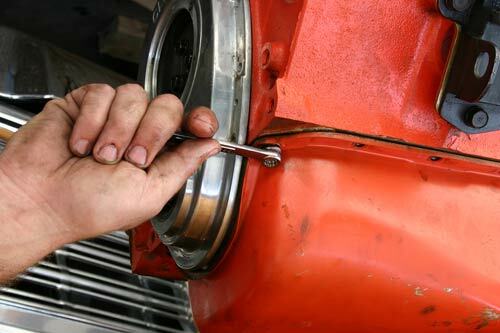 Using a small screwdriver or pry bar, carefully remove the oil seal from the timing cover. Clean out the inner lip of the cover to ensure a clean, leak-free seal. To install, first support the underside of the cover to prevent warping or damage. Lubricate the new seal with clean engine oil and place it into position. The open end of the seal should be facing the inside of the timing cover. Carefully drive the new seal into the cover using the proper installation tool. Timing covers themselves can often be the culprit of a nasty oil leak. Most factory timing covers were of the stamped steel nature. Although they are superior to the aftermarket stamped steel pieces you find today, they still had their weaknesses. The thin outer flange on a stamped steel cover bends and distorts when you tighten the cover bolts. This causes the underlying gasket to “walk” around on the surface and possibly break, guaranteeing oil leakage. Fortunately, there are plenty of quality aluminum timing covers on the aftermarket to prevent such messes. Most are machined with thick, rigid flanges that will not under flex under load, and provide deep channels for the gaskets to fully seat and seal. To reinstall the chain and sprocket assembly, first make sure the crankshaft timing mark is facing upwards at the top of the sprocket. Insert the new chain on the camshaft sprocket with timing mark facing downwards at the bottom. 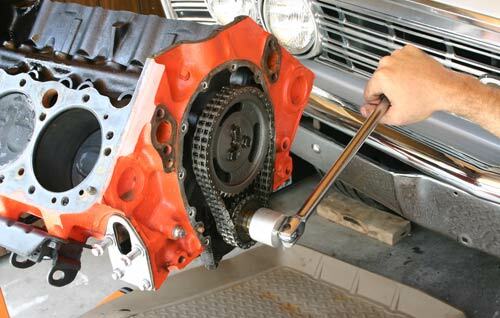 Slip the chain underneath the crank sprocket while positioning the upper cam sprocket at the end of the camshaft. Make sure the marks are aligned, once again facing each other. Insert the upper sprocket bolts and tighten to manufacturers specs. Prior to reinstalling the cover, thoroughly clean the mating surfaces of all old gasket material and residue. Apply the new gasket to the block with a small amount of sealer on both sides. Proceed to install the cover and the mounting bolts. If you removed the oil pan completely, use a new gasket. I highly recommend one-piece rubber oil pan gaskets. They seal far better than the conventional cork gaskets with bridge seals. They may not be available for all applications, but it’s worth checking into. Install the new gasket and the oil pan, and refill the crankcase. Be sure to fill the cooling system as well with new or clean fluid.